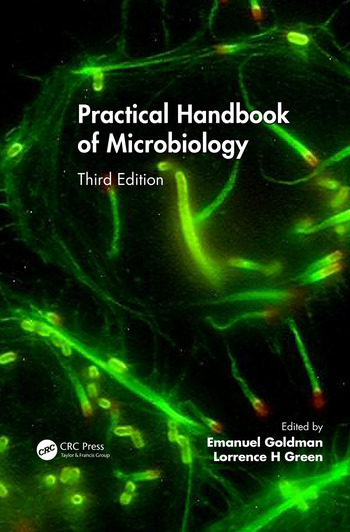 Westbury Diagnostics, Inc is proud to announce that the Practical Handbook of Microbiology, Third Edition was released on June 4, 2015. The nearly 1100 page book contains 51 chapters, and was written to provide basic knowledge and practical information about working with microorganisms, in a clear and concise form. Although of use to anyone interested in the subject matter, the book was intended to especially benefit two emerging groups of microbiologists: people trained as microbiologists that are highly specialized in working with one specific area of microbiology; and people that have been trained in other disciplines, and use microorganisms as simply another tool or “chemical reagent. New to the Third Edition was a chapter entitled “The Business of Microbiology” intended for investors in the Industry. The Practical Handbook was again published by CRC Press, who are renowned for their nearly 100 years of publishing books in life science, medicine, pharmaceutical science, food science, environmental science, forensic science, engineering, business, technology, mathematics, and statistics. Dr. Lorrence H. Green, President Westbury Diagnostics, co-edited the book and also personally authored three of the chapters, and co-authored two others. Lorrence Green is known for inventing Long Island’s first biotechnology product, a test kit for measuring streptococcus antibodies. Since 1981, Dr. Green has developed over 40 tests currently used by clinics and hospitals to detect microbes. In March 1999, Green moved Westbury into the Long Island Forum for Technology’s incubator at SUNY Farmingdale and has been there ever since. His invaluable experience in the microbiology sector of diagnostics has led him to commercialize and patent multiple biotech products. In addition, Westbury Diagnostics has a proven track record of outsourcing clinical trials and succesful FDA submissions. Frontier Pharmaceuticals hires Westbury Diagnostics to test DioxiBrite - a plaque and bacteria killing toothpaste. The active compound was screened against strep, staph, E. Coli, and yeast. Most toothpastes work by physically removing plaque, the sticky substance on teeth, made up of bits of food, in which the bacteria live. Frontier’s brand, DioxiBrite, actually kills them. Only Colgate-Palmolive has a similar product, Colgate Total, using the antibiotic Tryclosan. “We are better on plaque and just as good on gingivitis,” Frontier says. The findings were reported at the Annual Society for Microbiology.